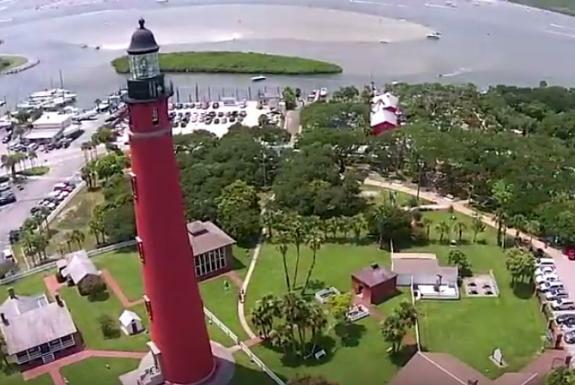 Some would say the entire Ponce Inlet area is a hidden gem, but the 175-foot-tall Ponce Inlet Lighthouse sure makes it stand out. The lighthouse is Florida’s tallest — and you can climb to the top for some of the best views in the state! Soak in an unbeatable 360-degree view of the Atlantic Ocean, the Intracoastal Waterway and the entire Daytona Beach peninsula. If you dare to tackle the 203 steps to the top of the lighthouse, you’ll be able to grasp the area’s magnificence from 175 feet above the ground. If you’re not the lighthouse-climbing type, there’s plenty to enjoy while strolling around the lighthouse and museum grounds, including a rare Fresnel lens exhibit. The lighthouse originally burned a kerosene lamp — one that could be seen for 20 miles away. By turning that relatively weak light of an oil lamp into a bright beam visible from many miles around, these lenses revolutionized lighthouses upon their U.S. introduction in the mid-1800s. The first-order Fresnel lens is the one on display at the lighthouse. In 2004, the third-order rotating Fresnel lens was restored and returned to the lantern room, where it remains today. You can experience it all from 10 a.m. to 5 p.m. daily, with extended hours during the summer. To capture an up-close view of the inlet from low ground, visit Lighthouse Point Park. This 52-acre preserve is a scenic place to take in the offshore and inshore views, enjoy a picnic and stroll the boardwalks to Ponce Inlet Jetty. If you’re willing to face the early alarm, you can even catch one of the best sunrises in the Daytona Beach area at this jetty. Once you’re in the park, you can drive south to the jetty, park and walk out to this spectacular point. It’s truly a must-see if you’re anywhere in the vicinity. If you linger beyond sunrise, you can go fishing off the jetties, cool off with a swim, walk the nature trails or make your way to the observation deck and tower — the perfect place to take in all of the magnificent scenery. Birdwatchers especially love this nature haven! Plus, recent renovations have restored the jetties and made them fully available, and the park is ADA accessible. There is a nominal $10 fee per vehicle to enter the park. Ponce Inlet is also part of Daytona Beach’s romantic side and is the ideal spot to discover something new together. In fact, Ponce Inlet offers numerous ways to experience a different kind of date. Adventure seekers can line up all sorts of activities to enjoy the wild side of the inlet, too. From jet skiing, kayaking, paddleboarding and parasailing to offshore and inshore fishing, there are several outfitters in Ponce Inlet that are happy to help outfit (via sale or rental) your next excursion with the proper gear. Whether renting kayaks or buying new sunglasses, you’ll find everything you need within easy reach in Ponce Inlet. Have a hankering to learn to surf? There are plenty of surf instructors nearby in Ponce Inlet. When you’re ready, bring your own board to the inlet, a not-so-secret favorite place where locals love to let it rip. Yearning to sail but lack the skills? An all-hands-on-deck excursion with Eagle Yachts and Sailing Charters will change that. Or, let someone else take the helm by chartering a boat for sailing, sightseeing tours or fishing. One thing is for sure: Ponce Inlet is abundant with marine, sea and birdlife. In addition to getting the perfect picture of its tranquil sunrises and sunsets, shutterbugs love having dolphins or birds as subjects — and there are certainly plenty to choose from around here. To launch into the marvels of Ponce Inlet’s natural wonders, choose from two eco boat tours that run regularly from Ponce Inlet Watersports and The Manatee – Scenic Tour Boat. Or, create your own dolphin-viewing adventure on the Wilbur Rose Paddling Trail. You can hop on the trail, accessible from the charming Wilbur Boathouse, with a canoe, kayak or paddleboard and explore the tributaries and Rose Bay. You’re also likely to see tortoise burrows along the trails throughout Ponce Preserve, a 41-acre park that stretches from the Halifax River to the Atlantic Ocean. It’s the ideal place to bring a packed picnic lunch or to launch canoes. At its heart sits Green Mound, an ancient Indian midden that presents a rare opportunity to hike vertically. Birdwatchers especially love this spot. The preserve is part of the east section of the Great Florida Birding Trail, so bring your binoculars, ascend the observation tower and check some feathered friends off your life list. Fortunately for birds and turtles that may become ill or injured, the Marine Science Center calls Ponce Inlet home. Not only is it a critical resource for rehabilitation, it provides unique hands-on learning opportunities featuring tree-lined boardwalks, an outside aviary with red-tailed hawks and eagles, and a sea turtle hospital with a viewing deck. Learn about the area’s unique ecosystems and artificial reefs, and join the celebration when a sea turtle is released back into the ocean. Visitors of all ages learn something new at the Marine Science Center — though nothing beats a child’s face when they pet a stingray for the first time! Of course, all this Ponce Inlet adventure can stir up quite the appetite. If venturing out at the crack of dawn, rest assured you’ll find good eats along the way at Cracked Egg Diner, famous for its granny smith apple fritters and eggs benedict. For lunch or a post-excursion ice-cold beverage, head to the award-winning Racing’s North Turn Beach Bar & Grill. Located at a historic racing landmark, here you can “ignite your appetite” with an order of a delicious sandwich, snack or drink. For waterfront views and a fun island vibe, head to Hidden Treasure Rum Bar and Grill. It’s practically in the shadow of the lighthouse and provides a great vantage point to enjoy fresh seafood, and a cold one while dining al fresco. Down the Hatch Seafood Company is a scrumptious seafood spot where your family can find a hearty lunch of fresh fish, sandwiches, burgers and more! If you have a hankering for peel-and-eat shrimp, this is your spot. Clearly, there’s no end to the fun you can have on land, in the water or even up in the sky here! Come see, do and explore in Ponce Inlet while on your Daytona Beach family vacation. It’s perfect for romantics, adventure seekers, family experiences and solo discoveries, so you just might need to add a day or two to your stay in order to fit it all in. If you go, be sure to share your favorite photos with us on Instagram!